DUG Insight User ManualFrequently Asked QuestionsFrequently Asked Questions FaultsHow do I import or export faults? Insight can import and export faults in three ways: using either the GeoQuest IESX format, VoxelGeo XYZ or using DUG's own (.dufault) format. This standard format can be produced by almost every software package. A single file can contain an arbitrary number of faults, each of which will be imported as a separate fault in Insight. Unassigned fault sticks are imported in the same way. Insight imports only fault sticks, from which it will build its own tesselated surface and fault polygons. Insight does not yet import fault polygons or surfaces from other software. The example above shows a GeoQuest IESX data file. The DUG fault file is a simple text format that may be more convenient for scripting. It consists of a single X/Y/Z point per line, separated by whitespace, with a blank line to indicate a new fault stick. The filename generally has the extension ".dufault"
The example above shows a VoxelGeo XYZ data file. This standard format can be read by almost every software package. By default, Insight exports the fault sticks to the GeoQuest IESX format (.dat file extension). If you have defined a velocity volume for time/depth conversion (see Converting Time-Depth), you can export the fault based on the time/depth domain. In the Fault tab, right click on the fault(s) you wish to export. 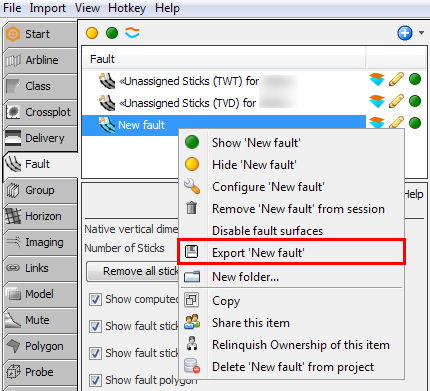 In the Export Fault window, select the time (TWT) or depth (TVDSS) domain to export your fault. Browse to the location you want to export the fault(s) and click Save. When exporting a single fault, Insight will also export the tesselated fault surface in a separate GoCAD TSurf file alongside the GeoQuest file containing the sticks. Next: How do I load well data?